"The shipment arrived in USA in 3 days & is fabulous! I'll buy more! A+ rated!" 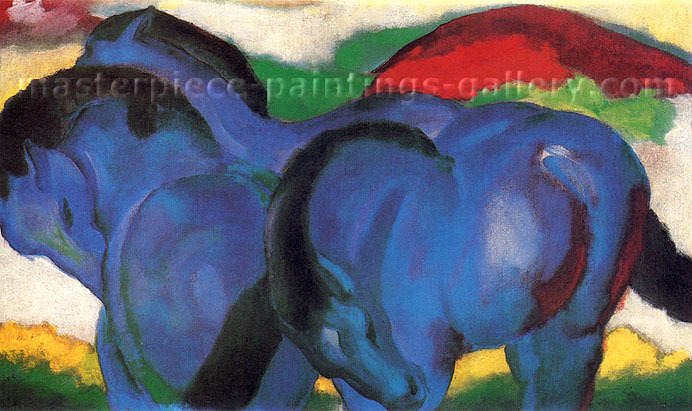 If World War I had not destroyed him in 1916, Franz Marc would probably have painted many more paintings like “Little Blue Horses ” aka “Die kleinen blauen Pferde ” which shows his great admiration for and wonderment at animals and animal beauty. We offer this painting in its original size of 24" x 39.8" / 61 x 101 cm. Horse I, The Bull, Blue-Black Fox, Monkey Frieze, Donkey Frieze, Stooks in the Snow, Dog Lying in the Snow, Deer in the Snow and the Yellow Cow. Marc's paintings are created from the standpoint of another animal. This is certainly the reason Marc's paintings became so popular after 1945 when escape from reality was still the main purpose art was acquired. Escape from reality often plays an important role in Marc's animal paintings. Marc was born in Germany, the son of a devoutly religious professor at the Munich Academy. He grew up with a great interest in theology but also had great artistic and literary ambitions. His family was supportive of these goals. He gained his love of animals and particularly horses during a year of voluntary military service in 1890. Upon completing his tour of duty he decided he was to become a painter. "Now I know for sure that I have found what is right for my nature, ” he said. Buy with Confidence — We Guarantee Your Satisfaction! We guarantee our reproduction paintings. We guarantee you will be pleased with the high quality and excellent value of your painting. If you are less than satisfied we'll make it right or refund the purchase price. We use only Britain's Winsor and Newton oil paints, the world's premier quality fine art paints. Chinese or other paints are a fraction of the cost but we want your painting to last for a lifetime — and beyond. That's why we also use premium grade canvas. It costs us more but you get a longer lasting painting. And most importantly, we use only tried and proven, highly experienced painters. Some of our painters have reproduced hundreds of masterpieces. And only if a painting passes our strict quality control do we make it available for purchase. If you have any questions, we'd be pleased to answer them. We have an “Immediate Response Policy ” and try to respond to email inquiries as soon as we receive them or at least within 24 hours. We will deliver this painting anywhere in the world using DHL Worldwide Express 3-day, door-to-door courier service. This allows you to track movement of your art online by going to on the DHL web site. Input your tracking number and you'll get a detailed status report. We send you the tracking number by email after DHL picks up the artwork. The canvas for each of our paintings is stretched on a frame during the painting stage. When the painting is sufficiently dry, it is removed from the frame and the face covered with Gateway Translucent Natural Tracing Paper for protection. It is then rolled and inserted in an extremely sturdy 2.5 inch diameter PVC pipe which is sealed, packaged, and delivered to your door by DHL. Easy Payment by Any Method! We accept all forms of payment, including cash, checks, money orders, money transfer (T/T), and credit cards via PayPal. PayPal is available to people in 38 countries. Paintings are shipped when personal checks have cleared and electronic transfers have arrived in our account. Please be informed that BillPoint will hold onto your payment for one week before even beginning the electronic transfer to us. PayPal takes 3-4 work days to transfer your payment to our account.